"The man in the saddle is angular and long legged�the gun in his holster is gray steel�its handle unmarked." Lean of figure and tanned of skin, his steely eyes gaze out over the violent frontier of the American West. He's a quiet man�but one not to be crossed. 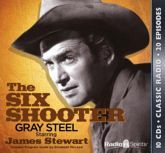 He's film legend James Stewart in his only continuing radio role as Britt Ponsett: The Six Shooter. Here are twenty tense, exciting episodes from the 1953-54 series -- including the original audition recording -- plus an informative Program Guide by radio historian Elizabeth McLeod!